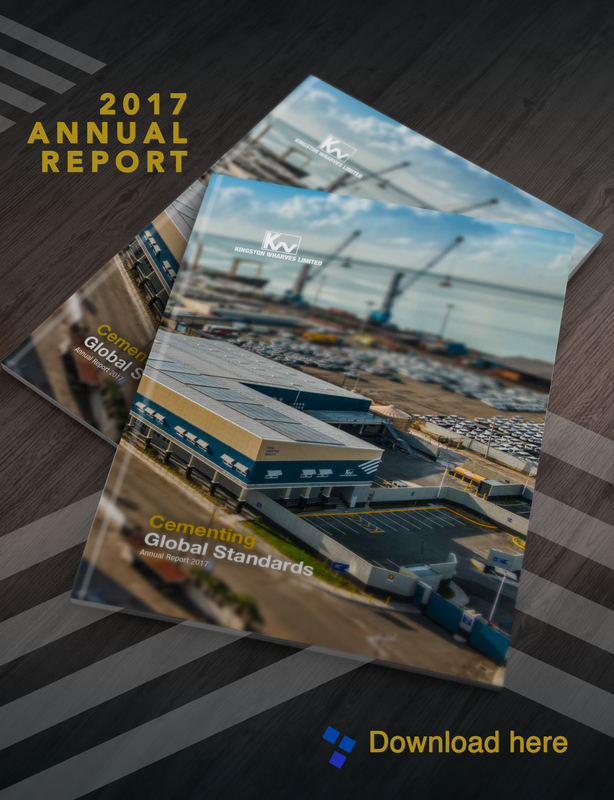 In our last performance report, we indicated that 2014 and 2015 would be pivotal years for the continued positioning of the KWL Group to reap the benefits of our world-class visionary and strategic direction. We noted that while we could not predict the future with certainty, the Group was prepared for the future;prepared to embrace the new norm of a rapidly changing industry and the opportunities that such transformation would bring. Our Diversified Business Model of Port Operations and Lead Logistics Provider, the opening of the Kingport Warehouse Complex (KWC) as the pilot for the Total Logistics Facility (TLF), and the Government of Jamaica’s approval of the KWL facility as a Free Zone, means that we were not only prepared but are living the future – Creating the Gateway to the Global Supply Chain. In 2014, we broke ground to Jamaica’s Gateway to the Global Supply Chain and changed forever the shipping and logistics landscape, locally and regionally. Logistics involves getting, in the most efficient way, the ideal product, in the designated place at the right time, for the correct customer at the best cost. Logistics and supply-chain elements touch everyone’s life, every day. Such will be the reach of the activities of the KWL Group! KWL is the only company that can boast about its role as operator and promoter under the Jamaica Logistics Hub Initiative – an initiative that has the ability to change the Jamaican economic landscape. In fact, we are the only Jamaican Company that has articulated its intent to undertake investments of approximately US$100 Million in preparation for the Hub. The investment in the expansion of our Port is of significance because of the potential Economic Multiplier Effect, especially as a result of our Free Zone designation and the implementation of our TLF. Ports play a major role in industrial plant location. Many manufacturing and processing industries locate their plants at or near waterfront sites to take advantage of low-cost inbound transportation of raw materials for production and outbound shipments of finished products to both export and domestic markets. Foreign Trade Zones, created by logistics activities on port property, also provide incentives for value-added manufacturing services and trade. Year-over-year, the management and staff of KWL tangibly demonstrate their strong commitment to the success of the Group through their performance and productivity. The Company has always acknowledged the importance and value of our human capital to our development and to our growth. In the continued transformation to Lead Logistics Provider, we will strategically examine how we retain, manage, and hire the best for supply chain leadership. We will look to best practices for the ideal logistics skill set and develop this and cross-functional competencies in management and staff. Also, we will maintain a competitive workforce through various academic programs and customized training focused on our needs. Our strong leadership in the industry is not only evident in our willingness to invest in Jamaica but also through continued acknowledgement and commendation for our leading role in the shipping industry in the Region. In 2014, once again, KWL was recognized as the Best Multipurpose Port Operator in the Region by the Caribbean Shipping Association (CSA). KWL’s performance has been consistently recognized among its Caribbean competitors (regional shipping lines, agents and other key port users); it won the ‘Best Multi-purpose Terminal Operator of the Year’ in 2006, 2007 and 2009. While our financial performance in 2014 was not what we would like, it was stable because of effective management and prudent cost-cutting efforts. The Group generated revenues of J$3.8 billion in 2014, a decrease of J$412 million or 9.7 % compared to 2013 but net profits increased marginally – from J$847 million in 2013 to J$849 million in 2014. Profit before tax was J$921 million a decline of 20% relative to 2013. Overall, Operating Profits for the Group for the period were J$1.1 billion, a reduction of 22.5 % from 2013. However, Security Administrators Limited (SAL) and Harbour Cold Stores (HCL), the Group’s subsidiaries, contributed J$70 million to Operating Profits and J$48 million to Net Profits for 2014, an increase of 37% over 2013. We will work assiduously to improve these results in 2015 as we should be far along the path to realizing some gains from our logistics efforts. Already, we have seen improvement in business development through new opportunities for revenue streams presented by our TLF and its offerings to the automobile, hotel, manufacturing, pharmaceuticals and other industries. New business development and diversification of revenue streams will be at the core of what we will focus on, especially in the context of recent important developments in the industry in Jamaica. The confirmation by the Government of Jamaica of a “long-term concession” to Terminal Link for the management and operations of KCT, signals increased competition. KWL has been strategic in its preparation for these events, forecasting both the challenges and opportunities that will arise from changes in our local operating environment and globally, as a result of changing trade lanes and demands. Therefore, the significant progress made in 2014 towards the creation of our Gateway to the global supply chain – the preparation of purpose-built trade facilitation and value-adding facilities, terminal readiness, business process optimization, and people development strategies – are of great import and well timed. We have cemented our local strengths and positioned for global relevance. Our success as an organization can only be achieved with the support of our many stakeholders including customers, shareholders, Board members, management and staff. I welcome Jeffrey Hall to his new role as Non-Executive Chairman and commend the Board of Directors for their unwavering commitment to successful leadership of the Group. A high-performance supply chain allows companies to efficiently deliver their products to global consumers at a more competitive price. The KWL Group sees itself as an innovator in the local and regional contexts and must deliver at this level. In 2015, we will harness new business development, fully utilize our intellectual capital and access technology and research that will keep us on the cutting-edge of logistics development. We will also cap the Year by celebrating 70 years of consistent and record achievements in the industry in Jamaica and the Caribbean.